The Revolved Triangle Pose or parivrtta konasana is classified in yoga both as a standing fold and a twist. There are several parivrtta trikonasana benefits, from an effective opening of the shoulders, hips, to a caressing stretch of the lower back, spine, and hamstrings. The twist demands advanced balancing, coordination, and flexibility, therefore featuring it mostly in advanced series of Hatha and Ashtanga yoga. It is often used in a sequence as a counterpoint for the Triangle and Extended Triangle Pose. 1. Stand on the upper side of the mat with the long edge of it to your back when performing the parivrtta trikonasana sequence. With a wide leg stance, bring your feet apart by 3-4 ft. Keep the heels in a straight line with each other and the toes should be pointing exactly to the front. 3. Thump down heavy on your legs strongly, engaging your pelvic floor as your lower belly is drawn in and pulled up. 4. Hoist your left arm up, synchronized with a deep inhale and lengthening of the spine. Let all of the breath out as you curve down from your hips, positioning your upper body parallel with the floor. Keep the stretch alive when doing this step of the parivrtta trikonasana, in the neck and along the length of the spine even as your left arm swings forward. 5. Spread your left hand on the floor, placed to the front of your right foot. Note: Alternatively, you can keep your hand on a yoga block for support. 6. Position your right hand to your sacrum or lower back at this juncture of the parivrtta trikonasana steps. Press firmly down to the ground with both feet, and push the right sit bone to the back, not allowing it to swing sideways. Now, straighten up your spine with a deep inhalation. 7. Bringing the right shoulder higher than the left, raise your right arm and perform a twist with exhalation to your right side. Your gaze has to be fixed with a head turn looking to either side, or to the point of your raised top hand. Stay tuned in this stance with five breaths, your legs rooted strongly and the pelvic floor along with the lower abdomen thoroughly engaged. 8. Release from parivrtta trikonasana with a deep exhale by lowering the right arm. Snap out the stance with a twist. Now place your hands back on your hips and come to stand with a thorough inhalation. Reverse your feet to resume the practice with the other side. Cultivating Mind-Body Concentration– At the heart of the yogic discipline, there is the challenge of cultivating concentration or ekagrata- one-pointed focus. A pose as intense and challenging as the Revolved Trikonasana, successfully hushes the chattering of an easily distracted mind and brings all of its focus on the painstaking movements. Even distribution of weight and work- Check overworking of the neck and underworking of the middle and upper body in Step 7. Twist equally along the length of the neck to the spine, to the tailbone and waist. Rotate the hips instead of twisting the Spine. Again bring your attention to the details of your body’s gyration. Try to swivel your hips rather than performing a spine twist. Improved Breathing with Opened-Up Chest– This twist of the parivrtta trikonasana sequence is also a good chest opener as both the shoulder blades push back and widen lung space at about Step 4. Expect to breathe more generously and do away with asthmatic constrictions with a regular practice of this pose. Relieves Back Pain– Involving a gentle spinal twist that can oil your vertebras and supportive rotation of the hips, this pose ensures nourishment for the back. Kindles the Digestive Organs– The twist also impacts the abdomen and the inlaid digestive organs positively, gently massaging and stimulating them. Hand To Wall Revolved Triangle– Do the twist by keeping both hands on the wall instead of placing them upon your hips. See to it that your upper body faces the wall and your hips are parallel to the wall. The wall here basically acts as a balancing board so that you can work the pose without fighting for balance. Hand On Shin Revolved Triangle– At Step 5, your left arm has come down from the hoisted position towards your feet. But touching the feet can be testing to the lower back, or may compromise the stipulation of forward folding with unbent knees. Negotiate this with more ease for your lower back, with a shin grasp instead of folding all the way down to the feet. The Revolved Triangle Pose does not go well in certain conditions, which are—the vulnerability of the neck, injury in the hamstring, sacroiliaca, lower back injury, or, from the third trimester of pregnancy. 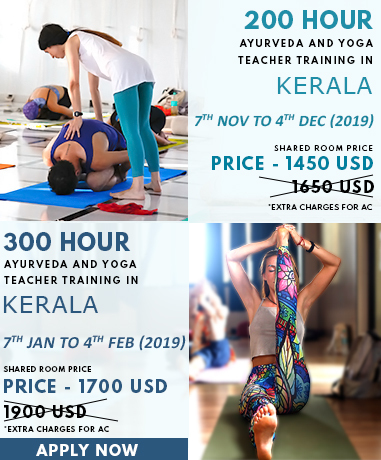 To know about Parivrtta Konasana in further detail, explore our Yoga Teacher Training In India.